Qantas coming to DFW. Now you can earn more than 17,000 AAdvantage Miles direct from Dallas. Even better, a Fare Sale and Double AAdvantage Miles through January 31. The route will see Qantas operate direct outbound flights from Sydney to DFW (as QF7), returning to Sydney via Brisbane (as QF8). DFW is the primary hub of Qantas’ fellow oneworld alliance member, American Airlines, and the two carriers will soon seek to expand their commercial relationship. Qantas will offer four return flights to DFW each week, featuring a three-class Boeing 747 aircraft. 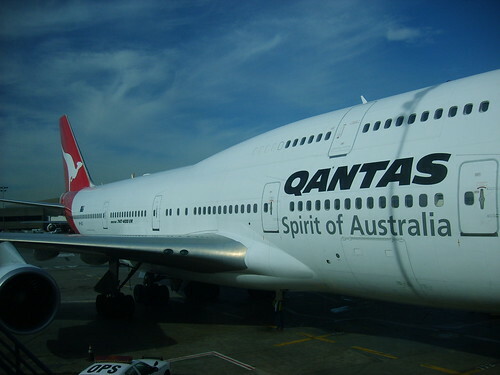 Direct Sydney-San Francisco (SFO) services will be discontinued on 14 May 2011, but SFO will remain part of Qantas’ network as a codeshare destination. Qantas Chief Executive Officer, Mr Alan Joyce, said DFW will be an excellent addition to the Qantas network and enable Qantas to strengthen its relationship with American Airlines. According to a report in the Dallas Morning News, DFW Airport offered a $3.1 million dollar incentive package to get help bring Qantas to Dallas. If you’re an airplane geek you’ll be interested to know that this will bring to three the number of Boeing 747s that fly into DFW. British Airways started 747 service to DFW in December and Korean Air has been operating a 747 on the Dallas to Seoul route for some time now. The flight from Dallas to Sydney is just beyond the 747-400ER‘s range, so it will stop first in Brisbane before continuing just over 250 miles to Sydney. The total distance of the 19 hour flight from Dallas to Brisbane is 8,303 miles making it the sixth longest non-stop flight. The 13 hour, 8,578 mile return flight from Sydney to Dallas will be direct, making it the third longest non-stop flight. According to MileCalc you’ll earn 17,381 total round-trip AAdvantage Miles. Through January 31, 2011 you’ll find heavily discounted introductory fares from both Qantas and American from DFW to Sydney. I found fares for as low as $1,054 including taxes, which is at least $300 less than the occasional deep discount fare. Right now, if you register for the Qantas 90th Anniversary Double Miles Offer, you’ll have the opportunity to save money and earn Double AAdvantage Miles (as much as 34,762 according to MileCalc). At $1,054 your cost-per-mile (CPM) will be just above 3 cents per AAdvantage mile! Some context: it’s very rare to do better than 6 or 7 cents per mile from DFW and you’re really lucky if you can get your CPM down to 5 cents from this market. Both the introductory fares and the 90th Anniversary Double AAdvantage Miles offer end on January 31 and you’ll have to travel between March 1, 2011, and May 31, 2011 (dates inclusive) to qualify for the Double AAdvantage Miles. A word of warning, not all Qantas fare classes earn full AAdvantage Miles. Some deeply discounted fare classes (Q) don’t earn any. If you book with Qantas confirm your fare class eligibility, or book your travel through American Airlines on an American Airlines codeshare flight (AA flight number, Qantas operated aircraft) to guarantee eligibility. I learned this lesson the hard way a few years ago.